What if you had a digital check book, but instead of keeping track of your own finances you could keep track of your states? The Louisiana check book, if implemented, would be and easy to use frequently updated website taxpayers could visit and see every cent state and local government entities spend across the state. Last week the Lafayette Parish School System endorsed this resolution for fiscal transparency and accountability in which they could be a part of. “taxpayers seeing how their money is spent I think it’s a good idea” said Chief Administrative Officer, Joe Craig with the Lafayette Parish School System. Lafayette parish school board members are hoping many other school boards across the state will think a state version of a checkbook is a good idea too. “I don’t know why you shouldn’t support it. You go to your personal checkbook you can see your transactions online. When you go to a government site it’s all in three hundred page PDF’s and very difficult to navigate.” said LPSS School Board Member Justin Centanni, who helped spear head the resolution in Lafayette. A user friendly state checkbook, isn’t a new idea. 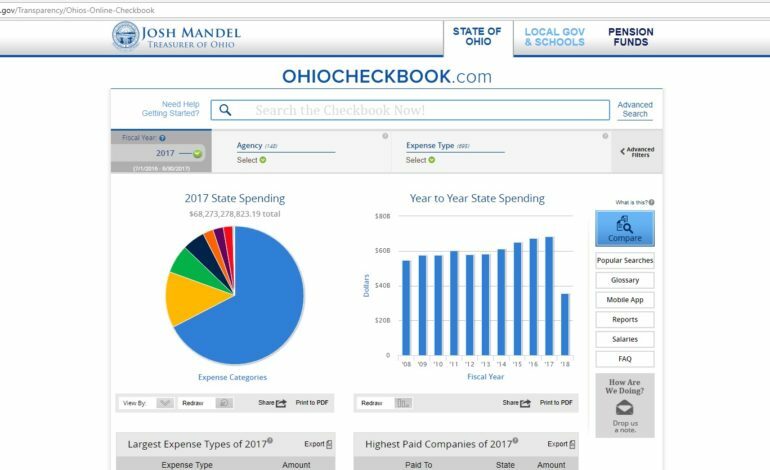 The state of Ohio’s treasurer launched their own Ohio checkbook back in 2014. “We actually spoke with someone in the treasury department in Ohio and asked them about the cost of implementation and he says that basically once he did that for the state of Ohio and opened it up to local government, local governments started having a hard time not doing it. Their voters and their constituents demand they take part in that as well” said Centanni. Louisiana has something similar called LA TRAC. “It actually got ranked in the top ten as transparent websites.”said John Stefanski, State Representative of District 42. “It goes one step further…it’s very user friendly” said Stefanski. “You can see how in a pie chart how numbers are being spent. You can select an agency and select a type of expense.” said Craig. The only push back from making a user-friendly sight mirroring Ohio seems to be cost and logistics. “Ohio spent roughly 800,000 dollars.” said Centanni. “That’s a lot of documentation so who’s gonna manage this data what’s gonna be the central location for all this data.” mention Craig. “As long as the cost is within reason this is a great idea for the state of Louisiana”said Stefanski. Justin Centanni says he sent copies of the resolution and endorsement to state legislators and school boards across the state. According to State Rep John Stefanski the next step would be a house member or a senate member filing a bill to create that system.